The Plumen 001 is the world’s first designer energy saving light bulb. The energy saving light bulb is a neglected, yet inspiring invention. It uses 80% less energy than the traditional incandescent light bulb, keeps electricity bills down and is better for the environment. It also lasts around eight times longer. Despite this, we tend to buy them out of moral obligation. To some the problem is the light they give off, to others it is the way they look. Both can be solved. We believe the answer is in the design. Make the bulb attractive and people will spend a bit more to enjoy a better quality of light and a design they appreciate every day. Glass tubes can be bent in many different shapes so why are there thousands of manufacturers but only three designs? Plumen aims to address the problem. 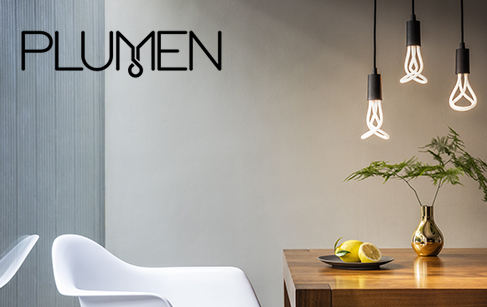 The name Plumen comes from the “plume,” the decorative feathers of a bird and “lumen,” the unit of light. The Plumen 001 is a Hulger product and was designed by Hulger & Samuel Wilkinson. The Plumen 001 was awarded the Brit Insurance Design of the Year in 2011, one of the world’s highest profile international design awards. It was also awarded the prestigious Black Pencil at the D&AD awards in the same year. It has also been recognised by renowned design collections around the world including the Victoria & Albert Museum in London, the Finnish Design Museum and the Cooper Hewitt collection, based in New York.